What would Don Corleone say? Organized crime on Facebook? To find out, I’m looking forward to watching Coppola’s three-part “Godfather” Saga on one of the cable channels this weekend. It’s an offer I can’t refuse. 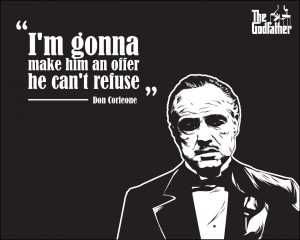 “Godfather I” is classic. “Godfather II” is one of the of the few great sequels ever made. “Godfather III” didn’t fit in with the others, but had its moments, such as when Don Michael Corleone confesses his murder of Fredo to the new pope — who looks like the new pope of 2013-14. Say what you will about Shrimp Boy, but that’a a great nickname, right up there with Lucky Luciano, Scarface Al Capone, Vinnie Carwash (Frogiero) and Bugsy Siegel.